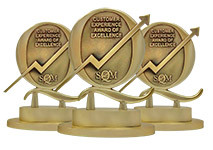 Congratulations on winning a 2018 Contact Center Industry Customer Experience Award of Excellence! As an award-winner, we would like to offer you exclusive access to a selection of press kit items that we welcome and encourage you to use for communicating and sharing the news of your outstanding success. Here is a selection of press kit items that we welcome you to use in the sharing our your award-winning success! For press releases that you will be creating, please email your proposed press release to Julie Henstock for review before you post to your PR channels. To share your success on social media, please feel free to use the following related hashtags #SQMAwards #SQMConference. Add this image to your email signature to let everyone know your accomplishments. Right-click and select "Save Image As"
Add this image to your press release, email blasts or website. Add this image to your email blasts or website. Use this Word Document as a template for your press release.